"We are people of this generation..."
On June 15, 1962, Students for a Democratic Society completed their manifesto, The Port Huron Statement, which would quickly become the ideological basis of the New Left. From its first line, “We are people of this generation, bred in at least modest comfort, housed now in universities, looking uncomfortably to the world we inherit,” The Port Huron Statement described the existential crisis of many Northern, white students as they experienced the disillusionment of the world that they were growing up in. From the campuses of their mega-universities, the students and activists witnessed the growing risk of nuclear war that the Cold War caused and the continual violence in the white segregationists’ resistance to the Civil Rights Movement. The students felt disenfranchised by the American Dream that encouraged consumerism and conformism while alienating people of color and the impoverished. Therefore, these students transcribed their frustrations and hope for a better world in the Port Huron Statement. A small collective group of students, mainly from the University of Michigan, came together in Port Huron, Michigan, during June of 1962, to write the Port Huron Statement. Tom Hayden, a former undergraduate/graduate student at the University of Michigan and former editor of the Michigan Daily, was a founder and president of Students for a Democratic Society during its early years. Hayden served as an organizer and leading voice throughout the anti-Vietnam War movement. Hayden was responsible for writing the first draft of the Port Huron Statement. After completing the original draft, Hayden participated in the discussions at Port Huron to finalize the manifesto. When asked during our interview with him what it was like to write the Port Huron Statement, Hayden told us that similar to how music can sometimes just come to a songwriter, “the document wrote [them].” In its published form, the new manifesto of the New Left combined the philosophies of the Columbian Sociologist, C. Wright Mills, the Civil Rights group, Students Non-Violent Coordinating Committee (SNCC), and their predecessors from the left to voice the concerns and goals of Students for a Democratic Society. 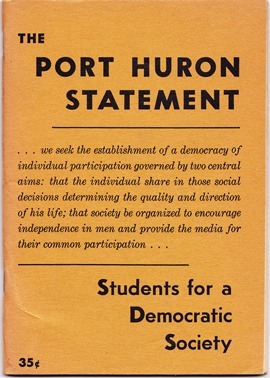 The Port Huron Statement called for the growth and implementation of participatory democracy across college campuses, in the South, and in inner cities. The writers of the document believed that ordinary citizens, particularly students, could create change through non-violent means. They saw the effectiveness of the young Civil Rights protestors of SNCC and argued that their radical tactics of meeting racism and segregation head-on were inspiring. They wanted to use these same tactics to achieve their own goals. According to Hayden, the idea of participatory democracy was particularly important because "it made you take action without being a dogmatist... [it led to the idea of] going to the people, and listening to them, and the construction of a decision." The Port Huron Statement's main concern was reforming American policy, politics of the left, and the University. The authors of the document saw the nuclear arms race, brought on by the Cold War, as the greatest threat to peace and security around the world. Therefore, Students for a Democratic Society called for the reformation of nuclear energy policy and armament in order to “avoid the unimaginable.” The writers of the statement saw American political bureaucracy, specifically within the Democratic Party, as the reason for the stalemate towards racial and economic progress. The Port Huron Statement called for voter registration of African Americans in the South and more liberal candidates in order to change the philosophies and practices of the Democratic Party. Lastly, these young writers of the Port Huron Statement saw the universities, that they were attending, as forces against free speech and free thought. They saw them as colossal, rigid institutes that dictated the lives of students too much and prepared them for the work force and nothing else. The students demanded free speech and the ability to think and act freely on campus. The mega-universities needed to open themselves up to intellectual conversation. The Port Huron Statement voiced the philosophy towards politics and social change that a whole generation of student activists in the New Left was adhering to at the time. It gave the youth an ideological argument for the transformation that they wanted to see in American life and politics. Its ideas radicalized the approach that people took towards changing serious issues throughout the 1960s and onwards. 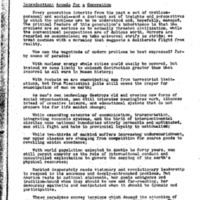 Without the Port Huron Statement, SDS would not have had an ideological manifesto to grow from, and the student-led anti-Vietnam War Movement would not have taken off as quickly, with as much potency, as it did. Students for a Democratic Society, "The Port Huron Statement," in Takin' it to the Steets, eds. Alexander Bloom and Wini Breines (New York: Oxford University Press, 2011), 50-60. James Miller, Democracy is in the Streets (New York: Simon and Schuster, 2004). Interview of Tom Hayden by Chris Haughey, Kevin Treirweiler, and Obadiah Brown, Ann Arbor, Michigan, March 29, 2015.